From the beginning, I knew there could be trouble: a box of cheeky new books on my doorstep, all dressed in their shiny covers, waiting to be read. All week I had been ranting about the contemporary world—its lack of tradition, its misuse of grammar, its insidious technologies. One television ad talked about the motel’s recent “refresh.” I was certain those brash new books would be full of such travesties, and my trusty old dictionary had been published in 1976. The newer dictionary is heavier, taller, three times the volume, and that means I can hardly lift it from the only shelf it fits on. So I stick with the flimsy pages that, for thirty-eight years, have given me most of the words I will ever need. Oh, I’m aware that technology has outpaced my old red companion, and that I could just as easily consult online dictionaries. But that would feel strange. When it comes to technology, it’s nice to be able to revise with a simple “cut” and “paste” (I can remember retyping whole pages because of one mistake, usually making another in the process). It’s not so nice to read everyone’s private life spilled out on Facebook as though they were next-door neighbors and we were talking over now-nonexistent clotheslines. Well, then, don’t go on Facebook, you say, and I retort All well and good, but I’ve also encountered some interesting discussions and/or opportunities there. So change is . . . well, change: something we might be cautious of, but also something we need to open ourselves to. Some people court the new, but for most of us, change requires adjusting over time. For example, in trying to protect its players from injury the NFL has come up with new rules that result in more penalties, more stopping of the game, more frustration for the fans. They’ll probably work out new ways both to protect players and let them play, but that hasn’t happened yet. In soccer, however, using a simple can of foam shaving cream to mark the line where players must stand during a direct free kick has made the game faster and less confrontational. All that jostling, the encroachments, the whistling, the stopping and starting—gone the way of the fast-fading foam. The only problem seems to be where the referees should store the can, and I’m sure that pretty soon their uniforms will sprout a convenient pocket. And what does all of this have to do with poetry, aside from the way Ray Hudson, my favorite sportscaster, can say, “There’s been an almighty monkey thrown into the wrench” or “He could make an onion cry”? When I spread out the contents of the box, I wondered what organizing principle my editor had used. The answer: they were all by people whose names he did not recognize. A quick glance told me I recognized only a couple—so, did that mean both of us had been settling for the familiar? That it was time to shake us up? Further inspection revealed at least a partial answer. Many of the collections were first books, and all the rest were second ones. We could let ourselves off the hook; how could we be expected to recognize those names? Not so fast . . . weren’t we keeping up by reading all the various traditional and online journals that were publishing these poets? No, we weren’t, or not as assiduously as we used to. There are so many people now doing it for us—prominently displaying the daily poem culled from somewhere else, throwing up the hasty review on blogs, proclaiming, propounding, proliferating. It was clearly time for me to look at work about which I had no preconceptions. I decided to limit myself to first books, and I determined to document the process. What basic observations could I make? To begin with, I was surprised to discover that most of the poets were not as young as I had expected them to be. For years now the seminal age of forty set by Yale has been creeping lower and lower. Maybe that trend is reversing. Next, I found no direct correlation between how much I liked the work and how much I liked the work of the poets who wrote blurbs for the cover jackets. In fact, the opposite almost held true. Blurbs, I’ve decided, mean almost nothing—and their vocabulary is so similar that my old dictionary developed a healthy sneer over the lack of variety. In general, first books have more individually published poems than subsequent books, and there did seem to be a correlation between the books I selected and prior publication. For the most part, the poems had appeared in good, substantial magazines. I was heartened to see a long list of regulars—Kenyon Review, Gettysburg Review, Missouri Review, AGNI, American Poetry Review, Rattle, Alaska Quarterly Review, New England Review, Crab Creek Review, Beloit Poetry Journal, Barrow Street, Poet Lore, and CutBank, to name only a few—along with now-established online journals such as the Cortland Review and the ever-present Verse and Poetry Daily. But does noting external validation say more about me than it does about the poets and their publications? Since I came to that question after the fact, I suspected this was due to my preferences, not my selection process. There’s little I can do beyond trying to keep a semi-open mind. With relative ease I divided the tall pile in half—those I needed to look at again and those I found nearly unbearable. Just what is “unbearable”? It turns out that I expect poetry to be more than prose with line breaks. More than a “story” with some vague insight tacked on in the final two lines. More than fragment, or odd combinations of words I must struggle to make sense of, and certainly more than trauma—however well dissected—for sensation’s sake. When I cannot hear any “echo” of meter, when there’s no pattern of sound, when the lines clunk along or make me roll my eyes, then I end up shutting the book. What other tendencies did I see? Aside from what I somewhat generously think of as an overall “innocence” concerning forms, throughout my original boxful, I encountered an epidemic of surrealism that even now perplexes me. Often, these poets seemed to be trying a bit too hard to see things slant . . . even deformed. In their hands, things do not work the way I expect them to. The world does not fall into place, slightly altered, the way it does in the hands of someone for whom even the surreal image is instinctive. Their gestures feel gratuitous, even learned, and I am left with the impression that many of today’s graduates are trying to manufacture mystery. I also realized that all of my selections were winners of contests, most for first books. Three had been chosen by a distinguished judge and the other two by a group of editors. I usually take no notice of contests, but I have to admit the judges were successful in discovering exciting new work and I applaud the presses that are willing to promote the accomplishments of previously unknown writers. I considered cutting another book to save space, but instead I determined to write shorter, snappier assessments with a focus on aspects of craft that might distinguish these new voices for the future. Face down in the unbelievable silk of spring. Mutating from “I wouldn’t / Lie to you” to “I would lie to you / If I could,” the poem pivots on contradiction. Of course one suspects suicide (“didn’t” and “either” act as qualifiers). Now the line breaks disrupt the flow of sense; a string of commas replicates the flow of less-rational emotion; internal rhymes (“place” and “face”) catch at the ear; repetitions (“down there” / “face down”) push her further away as the “suckhole” of the second stanza is transformed into the “silk of spring.” Resurrection is only possible in the imagination. “How can I live without you?” This plea is surely neither surreal nor symbolic. It’s a cry from the heart, but it’s not maudlin, not when it’s followed by “Come up to me, love / Out of the river / Or I will come down to you.” There’s that word “down” again. Because of the poem’s title, we realize that this is actually a subtle statement—that poetry tugs us under, connects us to the past and to each other, reveals the “scurvy” world as something to be wrestled with. By drawing on the world’s intrinsic images, Wright’s poem is an attempt at clarification, not obfuscation. My question becomes rhetorical. Why not strive for such an eloquent, intuitive mystery? “This is poetry, not just words thrown together, not just ideology and hot button stuff,” says Dorianne Laux of Michael Mlekoday’s The Dead Eat Every Thing, her selection for Kent State’s Stan and Tom Wick Poetry Prize. The unexpected declares itself early—“you write poems / like they brass knuckles”—but it takes only a second glance at “Self-Portrait with Gunshot Vernacular” to realize that such language is how the poet denotes the raw realities of his old neighborhood, full of the actual juxtapositions that depict life on that side of the tracks. We step into the surprising and nuanced ghetto world of Polish immigrants, a superstitious grandmother, churches and curses and physical violence. of death. You stopped speaking long ago. and the world looks bright as winter. of what they were looking for, what they found. Just the lights and then dark. Lights and then dark. I raise my feet to the table. and my pulse is both. “Thaumaturgy” records, “I’ve never / seen the ocean” and Mlekoday’s online academic biography states, “He has never seen the ocean,” yet I take in the fact that this poet has seen “a bloodstain shaped like a wave.” Without skipping a beat, his ocean and mine are one. I predict that we’ll hear much more from Michael Mlekoday as he finds his way through the maze of possible directions his work could take. I hope he will not stray too far from this passionate spirit that engages ear, eye, mind, and heart. inside their outlines, which is all we are ever able to do. deck & threw my palms up in the cold. Line breaks emphasize meaning here. “I made myself,” she announces; i.e., this is my doing. “Made / back / cold.” Winter creeps everywhere in the periphery. lines on a graph that can never touch. This is what you are building. I would give up all the lakesides, but not the late afternoons. treadle, metronome. Lift, settle, measure. Sift/shift/lift combines with the voluble movement of the loom (shuttle/treadle/settle), and those sounds, in turn, remind us that poetry—meter/metronome/measure—offers a way to make sense through music and craft. I prefer this subtle suggestion to her more overt poems about poetry. I look forward to following Kerrin McCadden into new territory. We can rely on her for more than a rendition of life experience; we can count on her to create a reflective world for us to enter. David Koehn’s Twine, selected by Jeff Friedman, won the May Sarton Poetry Prize, and Bauhan Publishing has done a beautiful production which highlights the more formal poems in the collection. Sestina, villanelle, sonnet, terza rima—Koehn has mastered them all, and then he’s concocted unique variations that provide a charge of energy. It’s almost as if he had taken a guide to poetic terms and experimented with every entry. He also finds ways to incorporate words that my poor dictionary has held its tongue over. “Camphorous,” “mycelium,” “globuliformis,” “hemimetabolous,” “scuppernong,” “thalassic,” “mirroneurons,” “pantagruelists,” “dithyrambic”: these spicy tongue-twisters add vim and vigor as they force the reader to “Jam / tongue into syllables.” There is no doubt in my mind that Koehn could take on any poetic task—anyone who employs the backward rhyme of “risen” and “resin” has my admiration—so my only question is . . . what is his underlying question? It’s abundantly clear that David Koehn is fascinated by scientific phenomena. In addition, he loves detail: stanzas filled with movie lore, including names, dates, every other kind of specific; lines full of statistics; a plethora of things such as Red Man tobacco, Royal Crown Cola, hula-hoops, cisterns, raspberries, mannequins, mayflies, the Delta flight from Cincinnati. A glance at some of the titles—“The Taxi Driver,” “Swimming Laps at High Altitude,” “The Attempted Assassination of Jules Verne,” “The Graffiti Artist Settles in the Eskimo Village,” “Shopping at Williams-Sonoma,” and “Communications in Accordance with Article 5, Paragraph 1 of the Agreement on the Rescue of Astronauts, the Return of Astronauts, and the Return of Objects Launched into Outer Space Partial Pantoum”—shows such a wide range of subject matter that diversity itself seems to be the glue holding the book together. The contemporary “ringtone” is as endangered as the nearly-extinct lunch tins, clothespin bags, and VHF antennae. Often a moment is “defined by what it is not.” We are forced to look at each poem individually; each plays out on its own terms, and so often the terms are illuminated—and complicated—by invention. A lopsided shipwreck of picnic, fire, and weather. Grandfather’s wake, spinning in the undertow. Internal rhyme—shale/scales; whipped/ship; packed/thwacking/wreck/wake—is further reinforced by alliteration and assonance. Somehow this poem becomes all the more personal as we watch the poet at play, working his words. “Parched” suggests “perched” (probably because of the word “edge”) even as it harks back to water; water’s memory (and we do believe it has one) thus holds thirst along with the sense of several generations who have loved this place. Herb garden, wine press, fishbones. Tractor tires, now gardens, now sandboxes. The windmills of Altamont Pass. A shadow of light passes through the room like a shark. What is it that brings us together, and keeps us apart? I have to admit to being more smitten with the formal distances of the book’s first section. In the absence of a strong narrative thread, and in the presence of such density, I suspect the collection is probably just a little bit too long, maybe too much of a good thing. Shaping the whole as meticulously as the individual poems would have resulted in something even more impressive, but if David Koehn continues to give us this blend of the formal and the idiosyncratic, it won’t be long before readers of poetry easily recognize his name. Winner of the Cider Press Review’s Editors’ Prize, Laura Donnelly’s Watershed quickly establishes itself as proficient. Craft, here, is more often than not found in its rhythms. I use the plural because there are two types of rhythm here. One is meter—the poetry flows with subtly accentuated beats. The other is the interrupted rhythm of thought—each poem builds its separate trajectory in order to follow its own deliberative process. Each is thus “personalized” by an interior voice as the two rhythms combine to establish what might be termed its “individuality.” The cadences of the spoken word leap off the page, and reading them becomes a kind of conversation. We fought on our way to the island. This same tendency toward exactitude can be seen in the proliferation of qualifying phrases (“of course,” “but that isn’t it,” “as if”), and it’s also the source of self-interrogation in the form of clarifying questions. The reader is taken into the mind at work so that any observation about music, or painting, or even family, is really an exploration of the self. The concept of “flickering” becomes a guiding principle. Thinking about Malevich’s painting of the knife-grinder, Donnelly applies his theories of movement to all of life. Everything is in motion, even the still life that can be animated, a bit like a flip-book cartoon. Even the human relationships that made Bonnard turn his wife’s head to allow her some privacy. Even the music—Casals playing Bach—where the notes “wait always / for someone to touch them again, for that / / same, not-quite-same-again flight—.” (This unexpected insight may be the best definition of “interpretation” I have ever encountered.) Later in the book, Donnelly returns to music, realizing that “scale after skeleton scale” can only approximate the “flesh” of the piece and might actually get in the way of what was heard. one direction comes back to haunt from another. what it does in return. if you walk through, someone warns. It would shatter if I didn’t. If anything, Watershed may be too short. Family members “flicker” in and out of the poems; even the works that are ostensibly about art or music often have familial underpinnings. Lost father, estranged brother, scientific mother, the lover who helps shape the speaker’s thoughts: they hover at the edges, broken into stilled components like the paintings Donnelly describes. They whet the appetite. for what it is—not omen. Watershed just may serve as a watershed. Or as a genuine omen. Laura Donnelly has waited long enough for this first collection that it has arrived with all the accomplishment of a later book. Her voice feels instantly necessary, even compulsory. Spare and elegant, a bit like a Zen garden, the lines circle and balance as the poem proceeds to open the world—that distinct smell that is rain, that knowledge of what rain can sometimes be. So it comes as no surprise to me that the University of Pittsburgh Press selected this book for the prestigious Agnes Lynch Starrett Award. This debut collection is nearly perfect—measured, never pretending to ask more than it can deliver, and yet producing poem after proportional poem with a satisfying precision. “Balance” might be the exact word to express what Jueds is striving for. Typically her poems advance by association, then take a small sidestep (often over an enjambed stanza break) and go on, creating a sense of the inevitable. Kasey Jueds has an uncanny sense of the way things are of a piece—even the absences: those hollow birds’ bones with an “emptiness at the center that lets them fly.” Uncanny, too, the places where Keeper intersects with Laura Donnelly’s Watershed. There’s the same focus on music, art, and swimming, the same basic images (swings, parallel tracks, even the same painting by Bonnard, though Jueds has her focus on the model, not the painter). Scattered throughout the book, related poems on the names of flowers, the habits of birds, cave paintings, the human/seal selkies of Scots and Irish lore, dead animals, shark and skin and blood—all do double duty, reinforcing each other even as they launch ideas in new directions. I used to think my longing had an end. You can almost hear the catch in the throat, the desire to hold on to the “everything” of experience. But, the speaker in “Mackerel Sky” insists, “Seems we can only look / a little at a time.” This outstanding collection is the result of that careful, microscopic looking, and from the attention this poet has paid to her sinuous craft. Kasey Jueds is a keeper. I took a look at some online commentary on Wright’s “To the Muse” and found myself appalled. So many assumptions. Such glib assertions. If we are going to expect our poets to have some sense of tradition and ask that they bring their own form of music to their task, then we must demand something of readers as well. To my knowledge, Wright never had a wife named Jenny, no wife who died of breast cancer; the procedure described in the poem is certainly not an abortion; this poem is not about Adam and Eve; James Wright did not commit suicide; there were nine muses, not three; and the doctors can remain doctors. Even the myth of Orpheus does not really apply (though it may hover as a kind of “ghost”). Where do all these “critical” assertions come from? Most of these “readings” would (I hope, even today) never be accepted by any creditable journal—and this is important to note if we are going to maintain anything that even resembles critical standards. Those standards get lost, too, as many journals print criticism so full of theory that the poems vanish in the process. My recommendation: a good dollop of common sense—and, if we want to toss around “facts,” a bit of fact-checking. Simple use of the web would have provided those self-proclaimed critics with some accurate information. Yes, the poem mentions ribs, breast, snake, doctors, river, night—but they have a context that needs to be considered. “To the Muse” adds itself to a long list of works Wright wrote for or about the disenfranchised, the forgotten, the poor and unwanted. It is not about him, except in his ability to identify and empathize and grieve. The grief is both personal and general—and that is an important distinction. Readers do not have to know Wright’s biography, but they cannot—should not—simply reach into their meager bags of personal associations. They need to know some basic facts of the world, need to note the emotional tenor of the poem, and . . . something else: they need to see how poetic craft shapes meaning, need to pay attention to stanzaic structure, to line breaks, to periods and commas and repetitions—and to sound. The unmistakably emphasized “do” and “you” of Wright’s earlier stanzas gives over to the long o of “alone” and “know” before the poem returns to a final “you” (the “muse”—whose vowel sound makes for further connection). The word “alone” appears twice—once at the end of a line, once on a line by itself—reinforcing the finality of death, its singularity. Poet and subject: each is alone, and the divide cannot be bridged except by the poem. So, readers and would-be reviewers—please, oh please, honor what a poet has actually accomplished. Honor the mysteries uncovered and explored. Speak a little tentatively. Do not indulge in easy conclusions that are merely surreal in their own right. Let language lead you by going where it has to go. †Judith Kitchen died on 6 November 2014 shortly after completing work on this essay-review. The Dead Eat Every Thing. By Michael Mlekoday. Kent, OH: Kent State University Press, 2014. 72 pp. $15.00, paper. Landscape with Plywood Silhouettes. By Kerrin McCadden. Kalamazoo, MI: New Issues Poetry & Prose, 2014. 84 pp. $15.00, paper. Twine. By David Koehn. Peterborough, NH: Bauhan Publishing, 2014. 112 pp. $16.50, paper. Watershed. By Laura Donnelly. San Diego: Cider Press Review, 2014. 75 pp. $17.95, paper. Keeper. By Kasey Jueds. Pittsburgh: University of Pittsburgh Press, 2014. 88 pp. $15.95, paper. 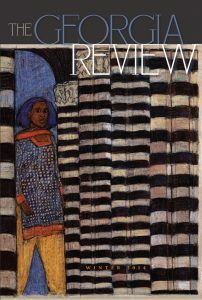 Judith Kitchen passed away on 6 November 2014, just days after completing work on the essay-review in Spring 2015 Georgia Review. The contributor’s note she supplied read as follows: “Judith Kitchen has three new forthcoming essays—in the Harvard Review, Great River Review, and River Teeth. Her most recent book, The Circus Train, was the lead publication in a new venture—Ovenbird Books, at ovenbirdbooks.org.” To that we respectfully add this brief overview of her writing and teaching career: Kitchen began as a poet, publishing the volume Perennials as the winner of the 1985 Anhinga Press Poetry Prize. She then shifted to prose writing of several sorts, with emphases on essays and reviews. Her four essay volumes are Only the Dance: Essays on Time and Memory (University of South Carolina Press, 1994); Distance and Direction (Graywolf Press, 2002); Half in Shade: Family, Photographs, and Fate (Coffee House Press, 2012); and The Circus Train (Ovenbird Books, 2013)—which appeared first, almost in its entirety, in the Summer 2013 issue of The Georgia Review. In 1998 Kitchen published a critical study, Writing the World: Understanding William Stafford (University of Oregon Press), and in 2002 a novel, The House on Eccles Road (Graywolf Press). She also conceived and edited three important collections of brief nonfiction pieces, all published by W. W. Norton: In Short (1996), In Brief (1999), and Short Takes (2005)—the first two coedited by Mary Paumier Jones. Kitchen also founded State Street Press in the early 1980s, bringing out over the next twenty years seventy-six poetry chapbooks, two pamphlets, five full-length poetry volumes, two collections of translations, and a poetry anthology—the State Street Reader. After teaching for many years at SUNY-Brockport—not all that far from her birthplace of Painted Post, NY—Judith retired and moved with her husband Stan Sanvel Rubin to Port Townsend, WA, from which they founded and co-directed for a decade the Rainier Writing Workshop low-residency MFA program at Pacific Lutheran University in Tacoma. The collection What Persists Selected Essays on Poetry from The Georgia Review, 1988–2014 was published by the University of Georgia Press in 2015.